If it’s possible to fall in love with your coffee maker, then prepare to fall hard with this beautiful purple machine. Coffee experts consider the Moccamaster to be the top of the line in drip coffee makers and we wholeheartedly agree! It’s not just the color of this grape beauty that hooked us; the coffee is the best we have ever tasted. We realize that’s big talk for Seattle folk (we heard there’s a famous coffee brand or two or five based here). If you love full, smooth flavor like we do, you’re going to be surprised at just how incredible every pot tastes! We tested it. A lot. It was hard work drinking coffee. Work, work, work. As with all our products at The Purple Store, we wanted to make sure the Grape Moccamaster was something you’d love and that the price tag was worth it. Every day for two months we “forced” ourselves to drink delicious coffee, daring it to come out bad even once. It didn’t. It’s even better if you use fresh beans ground just before brewing. This machine makes even crappy quality coffee taste good! Most coffee machines overcook the beans. Few get hot enough or push water through fast enough, leaving you with burnt coffee. The innovative element heats the water to an optimal brewing range (198-205°F). 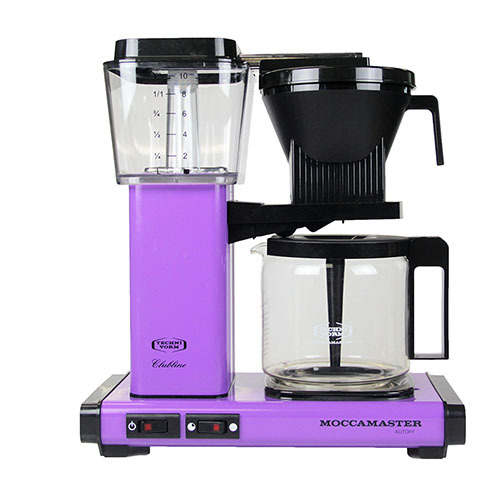 In each of our taste tests, this purple coffeemaker blew the competition out of the water! And it takes just six minutes to brew. Sure, it’s a lot to spend even a purple coffee maker. But like the purple KitchenAid mixer, it’s something you’ll use, something you’ll love, and something that lasts. Did we mention it has a full five-year warranty? That convinced us. Hand-built in the Netherlands, this purple coffee maker has a sleek retro design that will look great — and purple — in your home or office. Free US Shipping on the Grape Moccamaster for a limited time only! Thanks for making the world more colorful with us!